Microsoft recently reported the first quarterly financial loss in its history. The reason was a big acquisition gone sour. Microsoft had to write off more than $6bn (£3.8bn) that it had spent to acquire Aquantive, an online advertising business. The result may have been more valuable to Microsoft than any of the more than 100 acquisitions it has made since. But the company's founder, Bill Gates, wasn't keen to buy PowerPoint initially. Long-time Microsoft executive Jeff Raikes told me recently Bill's original idea had been to add the option to print an outline as bullet points to Microsoft's word-processing software. He had even gone as far as sending a letter of intent to a software developer, who had developed the function to acquire it. But Jeff said he and others at Microsoft had convinced Bill they needed a specialised application to make graphical presentations. That is where I came in. I was working in a start-up called Forethought, where I had been managing the design and development of exactly that product, alongside programmers Dennis Austin and Thomas Rudkin. We had planned to release it on Windows, before realising Microsoft's system was unable to support it in its current state. So we switched our efforts to creating a version for Apple Computer's new Macintosh, which had been released in 1984. Sensing a demand for the software, Apple helped fund the program's development with its first venture capital investment. Microsoft then got in touch and offered to buy us, weeks before launch in early 1987. We didn't accept the initial offer, but it didn't give up. While PowerPoint 1.0 sold briskly to rave reviews, Bill Gates's team continued to negotiate. After six months of talks, and tripling its offer price, Microsoft finally completed the deal for $14m. PowerPoint became the first acquisition made by the company, creating a new business unit located in Silicon Valley. There was no plan for how to manage PowerPoint from Microsoft's headquarters in Redmond, near Seattle, because it had never before had a distant unit. This vacuum allowed my team to carry on with surprising independence for more than five years. We were kept hard at work by the incentive of completing our own product vision. After the acquisition, it took three more years of programming to improve Windows and create a version of PowerPoint for it. 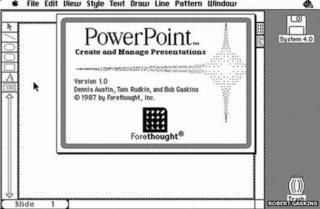 When both were finished in 1990, Bill Gates used PowerPoint to dramatically demonstrate the new capabilities of Windows 3.0. Sales of both products exploded, because presentation graphics was one of the strongest reasons to adopt graphical computers, and managers who made purchasing decisions wanted to use PowerPoint. Windows rapidly grew dominant, eventually outselling Macs 50-to-one. By 1993, the program had topped $100m sales annually worldwide on both formats. By that point Microsoft had started packaging PowerPoint with Word and Excel to make an attractively priced bundle called Microsoft Office. That idea made Microsoft the leader in application software which, alongside Windows, continues to be its major source of profits today. By then Microsoft had ballooned from 1,200 to 12,000 employees, and a decision was made to manage PowerPoint's future from a centralised group in Redmond. This led to the retirements of most of the senior PowerPoint people over the next couple of years. I was the first to leave. But the software programming remained in Silicon Valley and there was no disruption to PowerPoint's growth. Over the following decade, I was repeatedly surprised at how widely known PowerPoint had become. After retirement, I moved to London with my wife. When I went to open a bank account, I wrote down my employment history and was immediately invited to meet the bank manager. When we bought a mansion flat near Victoria station, the head of the block association asked me to talk with his son who was studying PowerPoint at primary school. It even came up after I chose to dedicate my time to music-history research. When I went to buy leather to make baffles - used to sweeten a concertina's tone - the company director showed me his PowerPoint presentations about goat skins being tanned in large vats in Edinburgh. I saw adverts in recruitment office windows advertising for PowerPoint operators. When I attended a conference at the historic code-breaking centre Bletchley Park, the organiser announced: "I'm told the inventor of PowerPoint is here, will he stand so we can acknowledge his contribution to science? ", which provoked laughing and applause. It amazed me that everyone knew about the program. And when Microsoft reported that huge loss from its recent acquisition, I noticed with interest that on the same press release it also announced that, 25 years on, its first acquisition PowerPoint was now installed on more than one billion computers worldwide. Robert Gaskins invented the PowerPoint idea, managed its development at a start-up for three years, and then headed Microsoft's business unit in Silicon Valley for another five years. He is also the author of Sweating Bullets: Notes about Inventing PowerPoint, in which he charts the program's history and influence.